Give your home or business an amazing new look with a professional paint job from Thinking Global Painting Co. located in Eugene, Oregon. When it comes to enhancing and preserving the natural beauty of your home or office, there is nothing quite as effective as new interior or exterior paint. 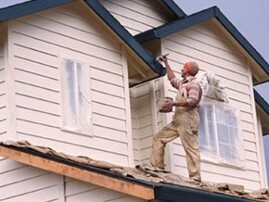 Exterior painting begins with cleaning and making sure the surface is not damaged by holes or gaps. Next, we prime any surfaces that need priming, and then we spray two coats of paint, brush trim and gutters, and spray the doors. Our company handles jobs of all sizes, from single-story homes up to three-story hotels. Starting by fixing holes, cracks, and blemishes on your wall, we will bring the interior of your home or business to a new level of stylish. We re-texture when necessary, spraying texture or adding plaster, Venetian plaster, or wallpaper. Additionally, we prep well to protect the areas that don't need paint. Finally, we spray or brush and roll the paint to add a brand new color to your walls. Thinking Global Painting Co will use any brand of paint our customer's request, or we will recommend a quality brand that will deliver last value -- usually Sherwin Williams™. A typical paint job takes between three and five days to complete. Each job includes repairs that other painting contractors often do not provide, and we use high-quality materials and skill to do so. Pricing can vary based on specific requests. Contact us today to request a quote for interior and exterior painting from Thinking Global Painting Co in Eugene, Oregon.